So if you read my previous post and I made you curious, this post will give you some of the “how” behind creating your own Doodles of Praise! First off, there are two things you need to overcome. First one, get rid of thinking you’re not creative enough. Even if your pictures look like your two year old drew them, that’s okay! It’s not about perfection, it’s about praise. As I mentioned earlier, I can have a picture of how I want it to look in my mind, but it usually never turns out that way. It’s okay, do it anyway! Second, you don’t have to have any fancy supplies. If you have kids, you probably already have all the supplies you need in their coloring cabinet. When I started, I used my “mom stash”. My kids are terribly hard on crayons and because I loved to color with them, I had my own set that only I could use. I grabbed a plain notebook at the grocery store and an old sharpie marker, a pencil and eraser and my trusty box of crayons…..that’s it. Dig into your kids art stash and I am sure you’ll find all kinds of things to use. Don’t have kids? Hit the Dollar Store and buy the basics! 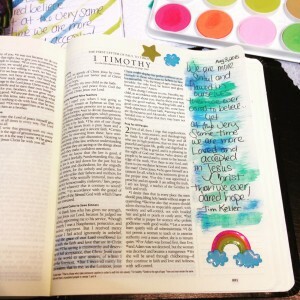 Till I found the bible I wanted, I drew on paper or drew in my everyday bible too! I know people who also just use a nice journal to draw in as well. Third, well I am sneaky, I stuck a third in, but this is important too…….Don’t compare. 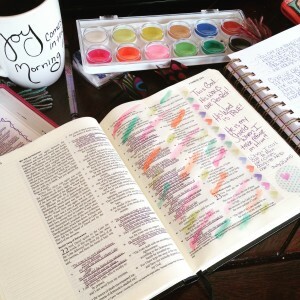 There are so so many beautiful pics of peoples journaling pages. Some people go all out and create these beautiful pages. Others use just a sharpie and doodles and they are just as beautiful! I use these pages as inspiration to create my own pages. While I don’t encourage you to copy, sometimes seeing others pages and trying what they have done will help you learn your own style or fuel your creativity for something else. Sometimes that’s what it takes to start. I use a ESV Journaling Bible by Crossway. They are wildly popular right now and often on back order as soon as they come out, but you can find them. Mine is a double column bible, but I honestly recommend a single column one as it will give you more room to write or draw. As for the tools, you don’t need much. A box of crayons or color pencils are a good way to start. I also use a nice pen that won’t bleed through the pages since my pages are a bit thin. Pigma Micron Pens are very nice as they won’t bleed through or fade, but a simple ball roller pen usually will do the same. Start simple, and move up as you get comfortable. I also use a simple set of water colors when I really want to get creative. Stickers, washi tapes and scripture cards are also fun ways to add things in. Sometimes I follow a bible study, sometimes it’s just a scripture that’s dropped into my heart. I take time to meditate on what the Lord is showing me or speaking to me. I find I keep a journal as well and if I don’t get inspired by drawing in my bible, I might draw in my journal. I think remaining open, and letting the Lord guide you in the process. There is no right or wrong way. Once you start, you will find your style and stride! A few helpful websites to get your started. Also a simple Google search of “Bible Journaling Pages” will probably bring up thousands of pictures to inspire you! Give it a try and get creative! Hashtag your photos at #doodlesofpraise so we can all enjoy!